IFA 2018: Audio Technica unveils its first true wireless headphones | What Hi-Fi? There's also two new pairs of wireless over-ears and a successor to its wired ATH-MSR7. Audio Technica has used the European stage at IFA to introduce its first true wireless buds, the ATH-CKR7TW and sport-orientated ATH-SPORT7TW. Both pairs utilize the latest low-energy Bluetooth 5 wireless protocol, although each has different priorities. The ATH-CKR7TW offers a solid six hours of playback from a single charge, with the charging carry case providing nine additional hours of juice. They use a specially designed and tuned 11mm driver, with a carbon coated diaphragm designed to deliver faster response times and reduced distortion. To further improve performance, Audio Technica has also isolated the acoustic and electronic compartments to minimise any disruptive airflow between them. Music playback and calls can be managed using the Audio Technica iOS and Android Connect app. While the ATH-CKR7TW’s in-ear fit has a ‘3D loop wing’ for extra support, the stability and fit of the ATH-SPORT7TW’s design are aided by Freebit earfins. 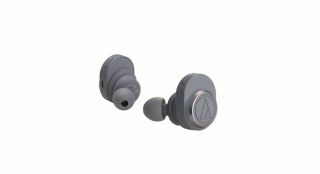 These sporty in-ears are a sweat and weather resistant (to IPX5 standard) design that can supposedly survive a rinse under the tap. For outdoor exercise, the buds have a switchable ambient noise ‘hear-through’ function, which allows users to hear their surroundings by simply tapping the left housing. Touch controls can also handle hands-free calls and music playback during exercise. The ATH-SPORT7TWs offer 3.5 hours of battery life from a single charge, although that can be bolstered by a further 14 hours via the charging carry case. A 10-minute quick charge should get you 45 minutes of juice. The Audio Technica ATH-CKR7TW (£229) and ATH-SPORT7TW (£179) will both be available in the Autumn. Audio Technica has also announced successors to its ATH-MSR7 over-ears, first launched 2014. It's claimed the ATH-MSR7b combines improved sonic performance and a more portable design that’s 53g lighter. Audio Technica claims its exclusively-tuned 45mm ‘True Motion Driver’ delivers faster response times and reduced distortion thanks to its carbon-coated diaphragm. The ATH-MSR7b inherits its predecessor’s ‘Dual-layer Air-Control’ technology, designed to reduce unwanted resonances. These over-ears also feature acoustic resistors for improved clarity. The new model also comes with two headphone cables, both 1.2m long. One uses a standard 3.5mm headphone plug the other comes with 4.4mm balanced connection. Available in black and gunmetal finishes, the Audio-Technica ATH-MSR7b will go on sale in the coming months, priced £219. Last but not least are the new ATH-SR30BT and ATH-SR50BT wireless over-ears, which also utilize Bluetooth 5 connectivity. The former offer a generous 70 hours of music playback from a single charge, while the latter settles for 'only' 28 hours but compensates with advanced features. The ATH-SR50BT feature a noise-reduction mode for reducing unwanted ambient sound, complemented by a hear-through function that allows users to reduce its function and hear your surroundings by simply clicking the button on the left ear cup. The ATH-SR30BT (charcoal black, blue grey, pink grey and natural grey) are priced at £99, while the ATH-SR50BT (black or brown grey) cost £179.